The great thing about personal finance is that it is everywhere. Everything you do and interact with is related to it, and you’d be surprised at the lessons you can draw from just about anything – including college parties! I was talking to friend who was going into summer break from his junior to senior year, and some of the stories he shared highlighted the best aspects of personal finance. It just goes to show how even in the oddest circumstances, personal finance topcis emerge. They’re both vodkas. The both get you drunk. But you can get a handle of Popov for about $8, where a bottle of Belvedere is going to run you $25+. The same is true for beers. Everyone loves a good beer – but you have your whole life to enjoy good beer (especially when you have money). College is the time to “enjoy” PBRs and hang out with friends until 4 in the morning. Part of being frugal is learning where to get the best deal on stuff. That’s why I’m a huge fan of Costco for college students. 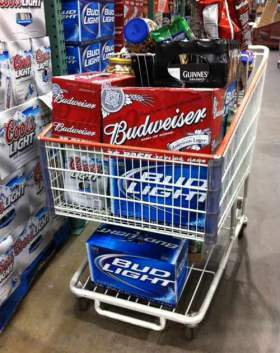 Buying in bulk saves money, and not just for booze. When you have to stock a house for a large number of people, Costco is great. You can get the huge boxes of TP and other essentials for very cheap! For the ladies (or other wine drinkers), you learn to find specials like wine flights and other cheap deals on wine. Many stores like BevMo have their 1 cent wine sale, and deals like Buy 6, Get 10% Off. All of these bulk purchases are great ways to save. As with any purchase/activity, you need to watch out for hidden expenses, and know what you are getting into before you buy. 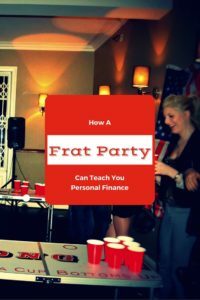 With a frat party, you need to be fully aware of the costs – cleaning up the mess and possible damage in the morning. Did your buddy just go through the living room sliding glass door? That’s going to be $500! Did another guy botch his keg stand and dump beer all over the carpet? Better call the carpet cleaning company. This just serves as a reminder that you need to know what you’re going to get. 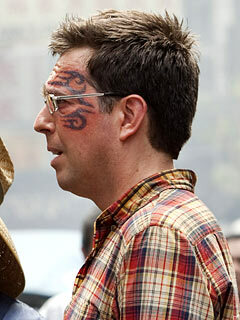 If you throw a crazy party, expect damage to occur. If you buy a car, understand that there will be maintenance costs. Finally, don’t do anything that you’ll regret – at a frat party or with money. Remember the tattoo from the Hangover 2? Don’t do that. The same is true with spending money you don’t have. You’ll just end up regretting it when the bill comes do, so save yourself the trouble and avoid it to begin with. The bottom line is be responsible – at a party or with your money. How else can a frat party teach you about personal finance? How about this: Pooling resources can have a big impact while costing each person involved little! Great call – I remember pooling beer money! My BF threw a lot of them and organized a bunch. They always knew how to get the most out of their money and where to get their kegs. They used limited decor (garbage bags on the walls for highlighter parties), cheap get-ups for themed parties, and they mixed jungle juice in the bathtub. I KNOW, sick. But we were young and all we wanted to do was get drunk 🙂 Fun times. Oh yeah, we drank cheap beer… I still shudder at Nat Light. That’s a great call using the bath tub – saves money on buying a bowl! I miss university now. Its amazing to see how people can get when they can want to party but have limited funds. I don’t even want to think about some of the things we did. Yes, it’s important to not get distracted and focus on the mission at hand when going into those stores.